Located in the Palampet village in Mulug Taluk, Ramappa Temple is around 67 km away from Warangal. It is located around 160 km from Hyderabad. 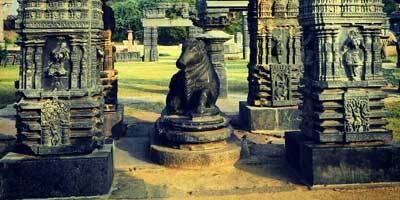 An important part of any Warangal tour, this temple is known for its historical richness and architectural excellence. The scenic beauty of the areas around the temple also makes it worth visiting. Ramalingeswara temple which is popularly known as Ramappa Temple dates back to 1213 AD. It was built during the reign of Kakatiya kingdom. Dedicated to Lord Ramalingeswara, it is the said to be the only temple in the country which is known by the name of its sculptor, whose name was Ramappa. Now under the administration of The Archaeological Survey of India, this temple presents a glimpse into the glorious past of this region and Kakatiya rule. Presently, there are cottages by the side by the lake side along with restaurant, which have been set up by the tourism department. Hence, you can explore this beautiful temple and the surrounding areas at leisure and later spend a relaxed time at the cottages. As per a few inscriptions, Ramappa temple was built around 1213 AD. This temple was constructed during the rule of Kakatiya King Ganapati Deva. It was built under the supervision of Chief Commander Recherla Rudra. However the temple came to known by the name its sculptor Ramappa. This temple is considered to be one of best among the medieval temples of South India. In spite of being decades old and witnessing various invasions and wars over the course of time, Ramappa Temple still stands majestically, creating a mesmerising impression on every visitor. Ramappa Temple is reached through a lush green path dotted with trees, which was once a royal garden. This temple although constructed with bricks that can float in water, is still standing strong. It is built on a 6 feet high platform. It is consisted of a garbhagriha, an antarala, and maha mandapam. The main entrance gate, which is built on the outer wall of the temple, is now in ruins. Hence, you will have to enter through the small gate. The main temple is surrounded by walls. The walls of the temple showcase intricate carvings. Even pillars and ceilings have been engraved beautifully. The sanctum, surrounded by pradakshina path is dotted with a shikhara. In front of the temple is consisted of many pillars with exquisite carvings. 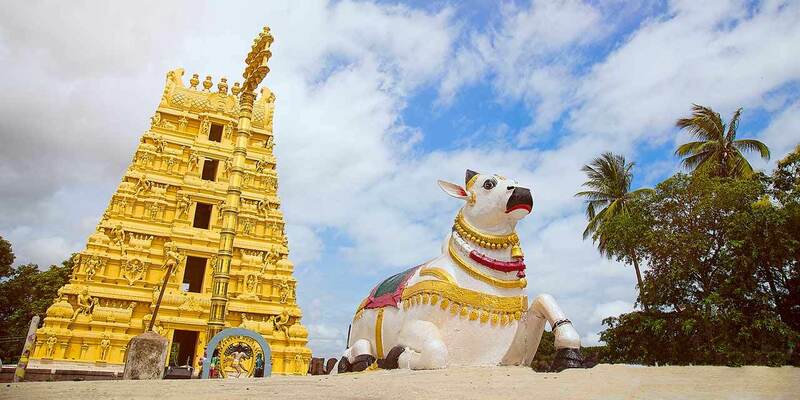 As you enter the temple, you will see a Nandi mandapam with Nandi, facing the Lord Shiva shrine. Although the mandapa is no in good condition, the majestic statue of Nandi, divine vehicle of Lord Shiva, is undamaged and presents an impressive sight. Inside the temple, Shivalingam has been placed at a height of 9 feet in garbhagriha. At the entrance of Garbhagriha, you will see carvings on the walls, showcasing various dance forms as well as different musical instruments. Its ceiling consist of carvings, depicting scenes from Hindu epics Ramayana, Shiva Purana and various other ancient texts. There are sub shrines in the temple, which are located on both the sides. Kameswara and Koteswara shrines are the two shrines built here; the Kameswara Temple is now in ruins. Ramappa temple, presents a classical style of structures as per which the main building of the temple is built on a raised platform so as to differentiate it. It is symbolic of the connection of Heaven and earth in the middle of both. Apart from its religious significance and historical importance and structural brilliance, Ramappa temple is known for a few unique aspects as well. The bricks used in building the Ramalingeswara Temple are light weight. Unlike other stones, these bricks float in water instead of sinking. Another aspect to notice in this temple is the pillars. Each pillar of the temple depicts sculptures and stories from mythology. It is also said that if you hit a pillar or a stone of this temple, you can hear musical sounds. Unlike most of the other Lord Shiva temple in the country, here Nandi is shown in an attentive posture, as if ready to take the command of the Lord and execute it. The darshan timings / opening timings of Ramappa Temple are from 6 AM to 6 PM. Ramappa temple is located around 67 km away from Warangal. It is located in Palampet village, which is about 19 km from Mulugu Mandal. To reach there temple, tourists are required to reach Warangal from Hyderabad or need to reach Hanamkonda. From here, one can board one of the many public buses that run up to or via Ramappa Temple at regular intervals. If interested in going at your own pace, you can hire a private taxi and travel to this temple from Hyderabad.